McIntyre Peak and Jacqueline Peak are located in the Pioneer Mountains, east of Ketchum Idaho. They're the main peaks on a divide that separates Big Basin from the valley that contains the headwaters of the East Fork of the Big Wood River. They're both good looking peaks, and are the southernmost 11ers in the central Pioneers. After the usual dilemma of deciding on the best peak(s) to climb (there are worse problems to have), it was decided that George, John, Pat, and I would climb "Mac & Jac" since the drive was shorter than some of the others peaks being considered. The road up the East Fork Big Wood River is pretty rough, especially after passing the Federal Gulch campground, but we made pretty good time and pulled over to start hiking at around 8am. The road was snow-free to within a half mile of the end of the line. It was a nice crisp morning, and we had a gentle warm-up on the trail for the first half-mile, before veering sharply to the northwest up the valley between Mac & Jac. We reached some snowfields in no time, and put on the crampons for some easy climbing in good snow conditions. Once we reached the upper bowl at about 9800', we got our first good view of the south face of McIntyre. There appeared to be three snow routes to choose from to reach the summit of McIntyre. The two outer ones looked to be the gentlest, but we ended up on the steepest one the went that went "up the gut". As soon as Pat decided to go on ahead and scout out the routes, I think we all knew which option would be chosen. The "up the gut" route ended up being very cool, as we followed a twisting vein of snow until it connected to a snowfield just below the summit ridge. I'd guess the climb averaged about a 45 degree slope, and was probably just over 50 degrees at the steepest. The snow was very stable, not too hard or too soft. But the steepness and the runout below kept us alert. 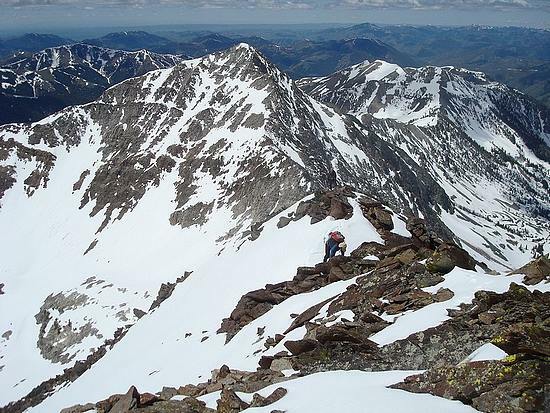 Once on McIntyre's summit ridge, we removed our crampons and traversed out to the highpoint. The views were spectacular, highlighted by Cobb, Hyndman, and Old Hyndman. We also had a good view of the steep south ridge of Big Basin Peak and could make out the imposing Brocky Peak to the northeast. After a snack and some photos, we began our descent off Mac and toward Jac. Our first inclination was to traverse the ridge, but it looked pretty exposed, so we talked ourselves out of that idea due to the tricky mixture of snow and rocks. Instead, we opted to drop a few hundred feet off the ridge, sidehill along a snowfield, then hopefully climb one of the lines of snow up Jacqueline's east face. But as it turned out, the snow was getting much softer as the day went on, so by the time we reached the base of the climb, it was way too slushy. So we decided to leave the snow and climb a steep rock rib instead. The rock in this area was surprisingly stable, and we ended up with a very fun scramble to the summit. It was a good time, in spite of being pretty pooped from climbing McIntyre earlier. The views from Jacqueline's summit were also very good, and there was hardly any wind, so we hung out for quite a while having a snack and taking in the scenery. I also spent some time flipping through the summit register, with entries dating back to W.A. McIntyre's from 1958. McIntyre name the peak after his wife, Jacqueline. The hope for the descent from Jacqueline was that we'd find some nice long snowfields, and glissade all the way back to the car. Luck was on our side, and after going down the ridge a ways, a bunch of snow came into view and we made good use of it. The slope and snow conditions were just right for glissading, and we were able to slide to within just a few hundred feet above the car with only a few interruptions. It was a blast, and way faster than walking too! All in all, a great day with excellent views and a good mixture of snow climbing, scrambling, and glissading. Overview map of our route. We went counter-clockwise, covering just over 5 miles round trip and 4100' elevation gain. On the approach trail, with McIntyre in the background. Pat and George climbing some of the lower snowfields. John and Pat crossing a large snowfield on the way to McIntyre. Looking up Jacqueline's east face while climbing McIntyre. Pat making his way up the snow vein on McIntyre's south face. John carefully making his way up the snow vein. Pat and John nearing the summit of McIntyre, with Jacqueline Peak in the background. Group shot on the summit of McIntyre. One down, one to go. The view northwest from McIntyre's summit, including Cobb, Duncan, Hyndman, Old Hyndman, and Goat. Looking across at Jacqueline during the decent from McIntyre. A look back at McIntyre while ascending Jacqueline. John on his way up Jacqueline, only a couple hundred feet to go from here. Pat on the summit of Jacqueline. Summit pano from Jacqueline, spanning from Cobb to McIntyre. Dave on the summit of Jacqueline, with the triumvirate in the background. A view down on Johnstone Peak, east of Jacqueline. We'd climbed this one back in February. George and Pat descending off of Jacqueline. Pat enjoying one of many glissades on our way down. The end of the line for glissading got us to within a pretty short distance from the car.